This kit includes everything needed to get drawing students started in one kit! The General's Drawing Class Essential Tools Kit is an art school approved set full of 13 mixed media drawing tools. Pencils are pre-sharpened. 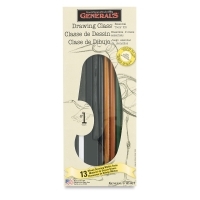 ® General's is a registered trademark of the General Pencil Company.™ Drawing Class and Essential Tools are trademarks.